First I want to thank all of you for your sweet comments yesterday on the death of my sister's beloved cat. It was a very difficult day and it will be doubly difficult when we have to go and tell her husband who is in the nursing home. I thought we should give her a couple of days to adjust before we do that. I am definitely not a book reviewer, but I am a nonstop reader and so I thought I would start sharing some of the books that I am currently reading. I love the feel and smell of books, but I also got an upgrade on my Kindle at Christmas with a new Kindle Fire. I love it, because I can also use it to connect to the internet. Much easier for me to see than my iphone. I keep my Kindle on one side of my bed and my library books on the other. I love that I am never out of reading material. Since I am on a limited budget, I look for books that are temporarily free or at a very reduced price on Amazon. 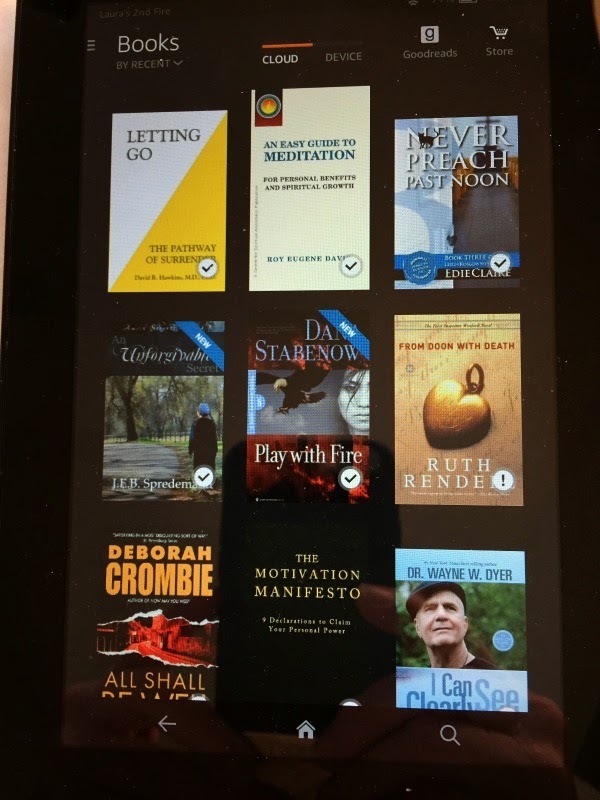 These are some of the books that I have on my Kindle. Some of these are books that I have read in the past and some I am getting ready to dig into. If you have never read the Deborah Crombie series of books I highly recommend them. They are British mysteries and they are wonderful. I would suggest reading them in the order that they were written as the characters progress. You will also notice a Book by Ruth Rendell. I am a huge fan of her Inspector Wexford books. I feel like I know the characters personally. Unfortunately, Ruth Rendell who is 84 suffered a serious stroke last week and is in critical condition. I feel saddened that there may be no more of the Inspector Wexford books. I am praying for a recovery for her. She is considered to be probably the greatest living mystery writer at this time, with over 60 books to her credit. Her stroke comes on the heels of the death of P D James, who was another of my favorites. I just got home from yet another auction and I am definitely ready to put my feet up for awhile. With the sun shining and temperatures in the forties and fifties I am a happy camper. I think I will brew myself up a nice "cuppa" and settle down with one of those British mysteries. Then of course tonight is a Downton Abbey night. Seems pretty perfect to me. I also love the British mysteries and I am sad to hear of Ruth Rendell's passing. At this moment I am anxiously waiting for Downton Abbey and it would be safe to say I am not the only one. Fortunately, Ruth Rendell has not passed yet, but she is in critical condition. I am praying for her recovery. Downton was great as usual. I read a lot and I use the library and my Kindle also. I also try to get free books on my Kindle. Limited budgets cause us to be really creative!! I'll check out some of these authors. We do have to be creative, Linda. I can also borrow books from the library on my Kindle, but they really have a limited amount available. Thanks, Gwen. I will definitely check it out. My husband reads on his ipad every night too. It's certainly a good way to read affordably. It really is, Kelly. I love it. I am waiting for the football game to be over so I can watch Downton Abbey. I recorded it AND I recorded the first one so I can rewatch it. I am sorry to hear of Ruth Rendell's stroke. I had heard that PD James had died. I loved her Dalgleish mysteries and now am even interested in her 'Death Comes to Pemberley.' I didn't watch it when it came on PBS because I hadn't realized that it was hers. 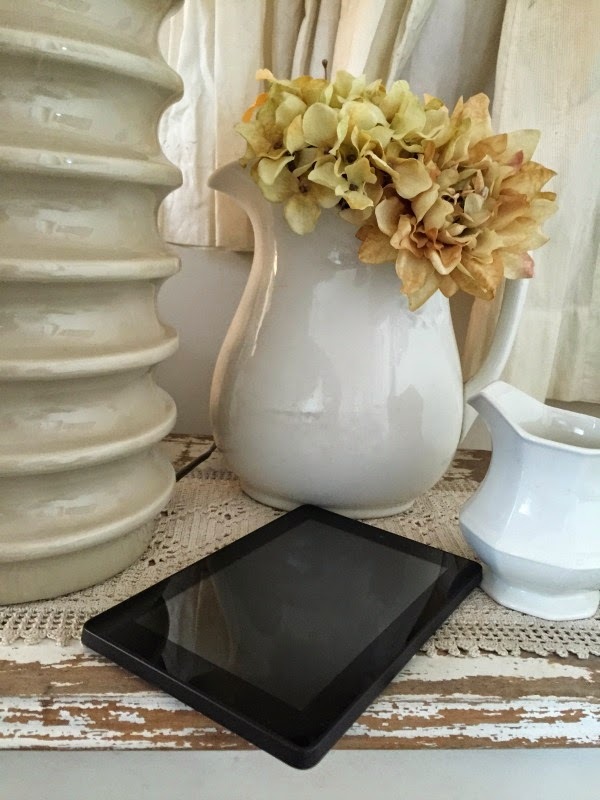 It's wonderful to have a Kindle, isn't it! Love it!